The Federal Government has introduced a new law dealing with use of physical and chemical restraints in Aged Care Facilities/Nursing Homes. It is called the Quality of Care Amendment (Minimising the Use of Restraints) Principles 2019 (we call it the ‘New Restraint Law’). 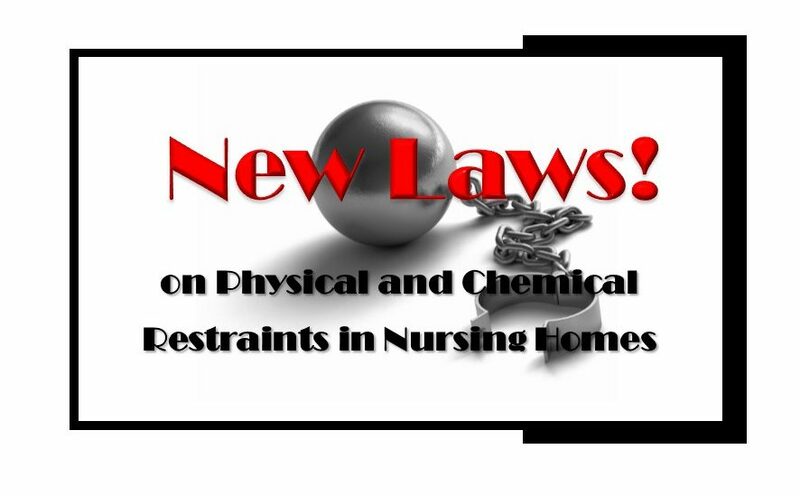 We have been advocating for regulation of chemical restraint use in nursing homes for some time. In this post, we take a look at this new law. In our view, older Australians in nursing homes are still not subject to appropriate legal protections. The bedrock of health and medical treatment is consent. You must give permission to the health practitioner to administer a medication or give treatment. In 1914 a famous American judge said: “Every human being of adult years and sound mind has a right to determine what shall be done with his [or her] own body; and a surgeon who performs an operation without his [or her] patient’s consent commits an assault”. This has been quoted many times by Australian judges and so forms part of Australian law. The law recognises that if a doctor or nurse administers medical treatment without the consent of the patient, they have committed an assault. If no consent is provided then the doctor or nurse has committed a criminal assault or a battery at civil law. If a person is affected by a health condition which impairs their ability to make decisions about their health, they may have lost decision-making capacity. In these situations, a doctor or nurse can only give treatment in certain circumstances covered by various laws of States and Territories. For example, in the ACT, a person can make a health care directive indicating they consent to future treatment. An Enduring Power of Attorney can enable someone to consent to treatment on that person’s behalf. Treatment can also be provided in emergencies to save a person’s life. When a medication is administered to someone with a mental illness who does not have decision-making capacity, it can only be given in the ACT in accordance with the Mental Health Act. It is illegal to administer a medication to treat a mental illness unless certain criteria under the Act is met. Can a Hospital Use Physical or Chemical Restraints for Treatment? The Mental Health Act 2015 permits medications be given without consent, or patients be restrained against their will, only in very limited circumstances. The Public Health Act 1997 permits a person be restrained in a certain facility if necessary for some medical condition, such as Tuberculous. The key point is that there must be a special law which authorises the restraint. Informed consent from the resident or their representative is obtained. Restraint in emergencies is permitted. If restraint is used, it must be for the minimum time necessary to respond to the risk of harm. There are strict documentation requirements if physical restraint is used. The New Restraint Law states that a chemical restraint is a medication used to influence behaviour, but is not a medication used to treat a mental illness or medical condition. So, a benzodiazepine medication to treat anxiety or insomnia is not a chemical restraint. However, if it was used to treat wandering behaviours in a person with dementia, then it would be classified as a chemical restraint. The use of the medication, and not the actual medication, is the important part. The resident’s representative is informed about the need to prescribe the chemical restraint. There are strict documentation requirements if a chemical restraint is used. A nursing home resident must be monitored for their response during the restraint. Also, the doctor or nurse who prescribed the restraint must be told of the resident’s response to the treatment. The physical restraint provisions reflect similar laws used for hospitals. In our view, the requirement for alternatives prior to use to be explored, and for physical restraint to address risk of harm, are appropriate. The laws could be better however, especially stating physical restraint must be a measure of last resort. We assess some significant problems with the chemical restraint laws. The need for laws on chemical restraints arises from the overuse of antipsychotics and other drugs, which have been shown to have large risks. While the physical restraint laws require alternatives to have been tried to reduce an assessed risk of harm, there is no such requirement for chemical restraints. Additionally, the New Restraint Laws do not authorise the giving of a chemical restraint to someone without their consent, or if consent has not been obtained, from a substituted decision-maker. It is clear that the restrictions on physical restraints are much more stringent than for chemical restraints. A nursing home resident may still refuse to take a chemical restraint. The New Restraint Laws on chemical restraint also do not replace the obligation on the nursing home to obtain consent before administering medications. For more details see our article Chemical Restraints in Nursing Homes. The New Restraint Laws indicate that State or Territory laws dealing with restraints are not impacted by the new law. This means that laws such as the Mental Health Act in the ACT, or on substituted decision-making laws, which arguably are laws dealing with restraints, will still apply to nursing homes. The New Restraint Laws also do not state that the presumption of capacity to choose or refuse treatment is displaced. Therefore, consent before treatment is still required. What this means is that the New Restraint Laws unlikely authorise the giving of medications when no consent from the recipient or their substituted decision-maker has been obtained beforehand. • What duty of care does a nursing home have? • Can nursing homes prevent a person with dementia from leaving the facility? • Who can make decisions about your health?